Wisbech Town Council provides one hour, free parking in the marked bays on the edge of the market place all day Monday, Tuesday, Wednesday, Friday, and when there is no market. Market trader access only to the half of the market place nearest the Horsefair. Thursdays and Saturdays the market place is pedestrianised and there is no vehicle access through the market place (from Church Terrace to the High Street). Parking may also be restricted during special events in the market place. 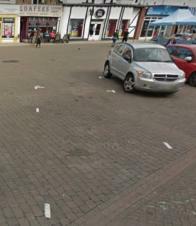 There are marked parking and loading bays available throughout the town centre. These are the responsibility of the Highways and Police. Please be aware of parking restrictions before leaving your vehicle as you may be ticketed.